[Lasalle] A training game | Glory Eagles de l'Empereur! At the right hand side of my lines I had (from the right) my Jagers, two units of Grenzers (as irregulars), and my Hussars under one command. 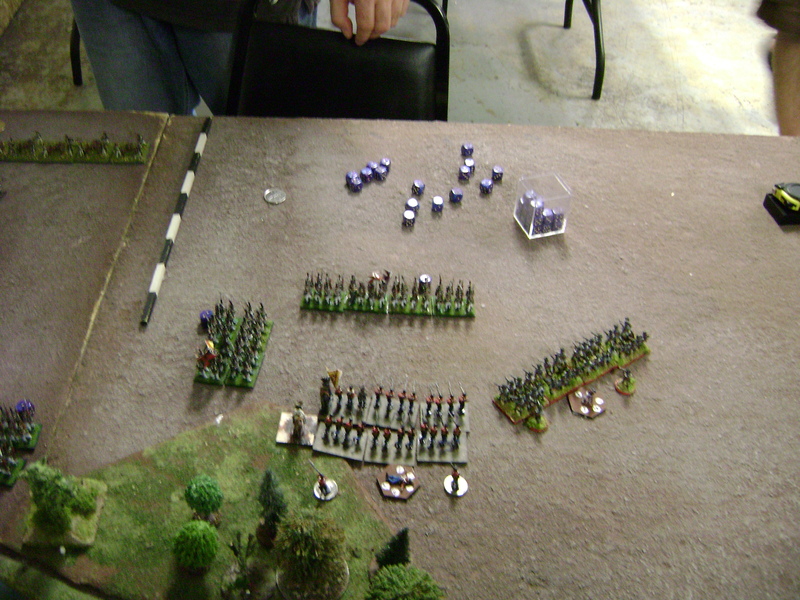 Heading towards the left, I had my artillery battery, three infantry units, and my Uhlans. 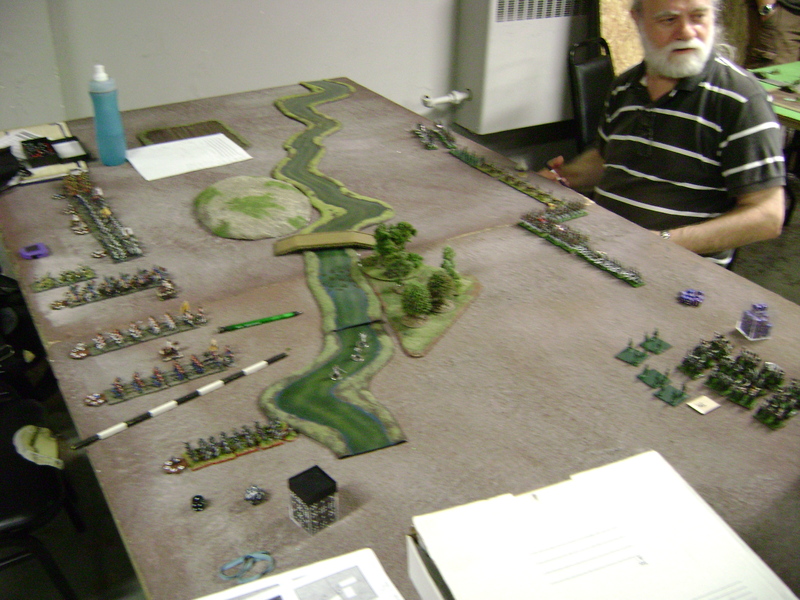 On Ernie’s side of the table, he had two huge artillery batteries (heavy guns too) protecting the objective (HQ tent), flanked by 2 units of grenadiers on his right and 4 on his left. As the attacker, I started, and advanced on my right towards the river and woods with my Grenzers, and the river with my Jagers, while the Hussars started off across the bridge. On my left, the artillery moved up but did not yet unlimber, while my infantry moved up to just behind the hill to shelter from the enemy guns. 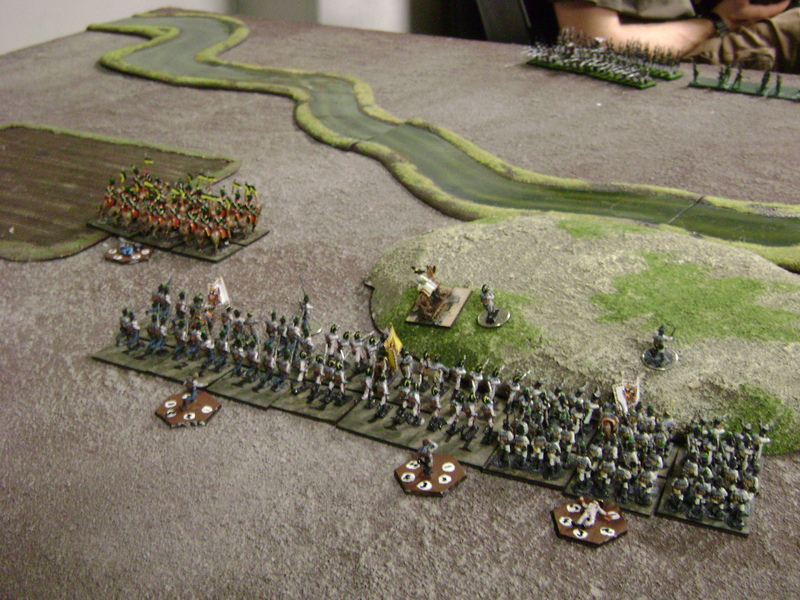 My Uhlans took off at a faster pace, hoping to get across the river early and do some damage. 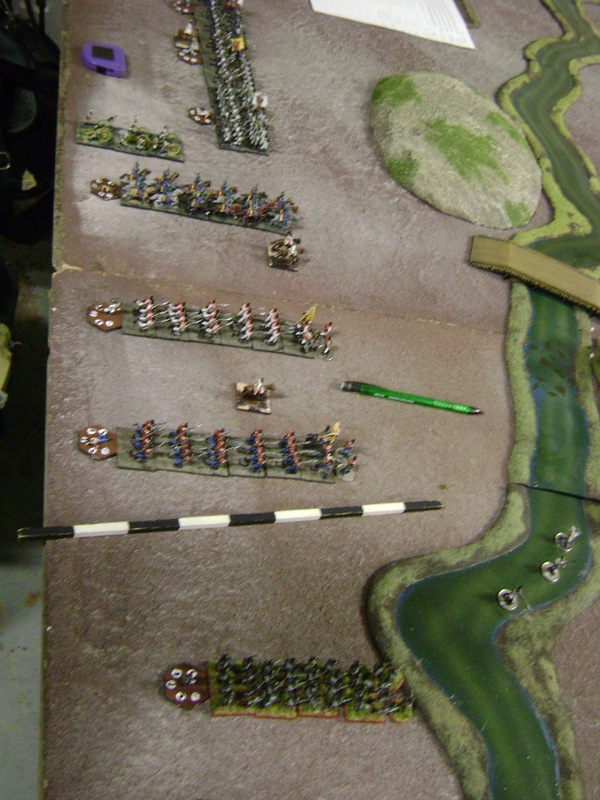 For the first few turns, Ernie moved his left hand side infantry up a bit and got them into line ready to receive my right hand force, and put the unit nearest the bridge into square to protect against the Hussars heading his way. He also kept blasting away with his artillery, which put quite the hurt on my Hussars. Despite the power of his artillery, I had to eventually pop my infantry up over the hill and head towards the enemy, taking a few disruption as I went. Normally I wouldn’t charge a square with depleted Hussars, but I wanted to show Ernie just what a bad idea it would be to do so, since this was a training game, and so I charged the square with my Hussars who were on 3 disruption. Artillery fire knocked them down to 5 disruption, and in the ensuing combat, I unsurprisingly lost, since I was on half dice for attacking a square with a badly disrupted unit against a fresh infantry square, destroying my Hussars. It made the point clearly that doing so was a bad idea. I also decided that rather than stay in the woods where I was on much safer ground, I would advance my Grenzers towards the enemy line and engage in a shooting match. I explained to Ernie that if I had followed my usual tactics, I could stay in the woods and count soft cover as well as shoot him if he got close, but if he came into the woods after me, he wouldn’t be able to shoot back. I also wanted to show Ernie the different shooting factors, so I had one Grenz unit in line and the other in assault column, while both had a skirmish advantage over his grenadiers – in cases like this, I have a slight advantage in that I’m shooting with more bases and get an extra dice for skirmish advantage, but I’m rolling on 5+ rather than 4+ because I have irregulars out in the open. We did a few disruption to each other on that wing, with my larger units making their presence felt. 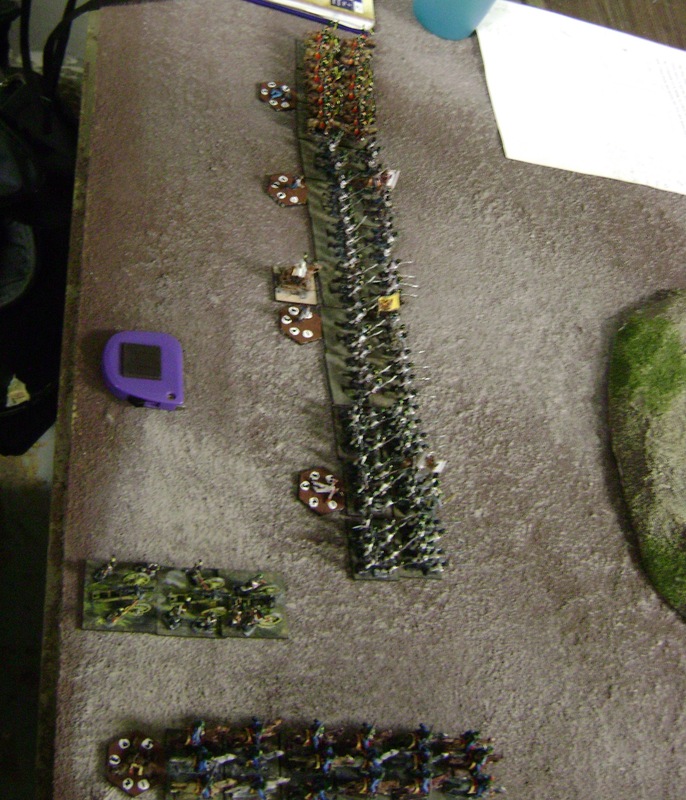 I also told Ernie that his units, being Valiant, would be better than mine in close combat, so he charged at me too. Even here I had somewhat of an advantage, having large units against his small units, but we both did quite a bit of damage to each other. Meanwhile on my left, my infantry had advanced and were crossing the river, and my Uhlans were about to charge his flank infantry, but his cuirassiers had also come onto the board now. I wanted to show why leaving your infantry in line was a terrible idea when enemy cavalry were about, so I charged his infantry with my Uhlans, and Ernie failed his discipline roll to turn them into square. The resulting pile of dead infantrymen was not pleasant. It did leave my Uhlans in a precarious position however, charged by some cuirassiers, but luckily for me, I managed to extricate myself with a fall back after only taking a few casualties. I also received my own reinforcements, and my cuirassiers galloped down my left flank to meet his. On the right, I’d managed to lose one Grenzer unit but had taken out two of the enemy units, and we started to play the manouevering game, my other Grenzers falling back a little so as not to get flanked and to head towards the safety of the woods, and my Jagers wheeling to do the same to the enemy. On the left flank, I hit one of Ernie’s cuirassiers with both of mine, with predictable results there, and charged his artillery batteries with my infantry, while assaulting his remaining infantry unit with both cavalry (Uhlans) and infantry, showing that if you get caught by combined forces, you’re completely out of luck – not only are you outnumbered massively (two large units onto one normal unit), but if you form square, the infantry halve your dice, and if you don;t, the cavalry halve your dice. Predictably, the Russian unit was vapourised. In my attacks on the Russian artillery however, I managed to lose both units of mine – having taken 4 disruption each on the way in, Ernie chose to stand and fire as a reaction to my charge, destroying one infantry unit from cartridge fire, and the other taking another disruption as they charged home before ignominiously rolling poorly against Ernie’s two successes, the one disruption from being on the losing side being enough to deal with them too. For a laugh, I also charged at the cavalry division’s artillery with my cuirassiers, and despite taking some disruption from fire as they charged home, they made short work of the Russian guns on the far left. This was enough to make both of us go over our morale break points, and Ernie was the first to have to roll, needing to get over 14 on five dice in order to stay in the game; unfortunately for him, he only rolled 12, and the game was over. This was a fun game, with some very bad tactical choices made in order to teach Ernie what usually does and doesn’t work for future reference. The main points I wanted to show him were that large artillery batteries are a real beast, as they can severely disrupt units that come towards them, and if they stand and fire when receiving a charge, can often do enough to win unlike my small artillery battery (if we’d had another turn, Ernie’s infantry would have charged my battery, so he could have seen how badly small artillery batteries cope with such a case); that cavalry charging a square are in for a hard time, especially if they’re currently disrupted; that cavalry charging an infantry not in square, on the other hand, would destroy them, and that facing a combined assault means almost certain death too; that irregulars are best kept to rough terrain, but that large units and skirmish advantages can make up for being caught in the open, but that being Valiant gives you an edge or at least evens the score against a larger unit. 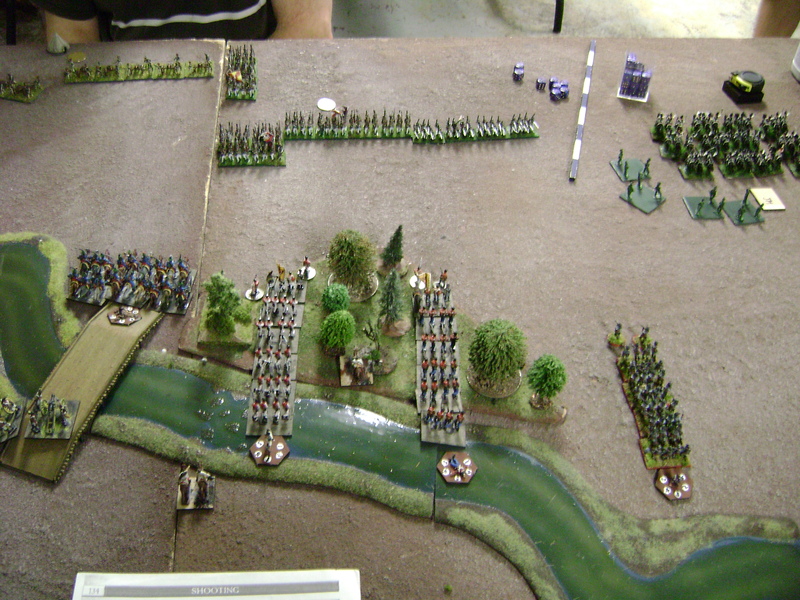 Ernie said that he enjoyed the game, and as an experienced Maurice player, he could see how these rules had evolved into Maurice, and how the more “modern” Napoleonic armies were more professional – several of the Maurice national advantage cards are taken as read for a Napoleonic force, for example, since all troops other than amateurs can oblique, artillery has a professional train and the like. Hopefully it won’t take too long for Ernie to get his Brits painted up, then we can have another bash sometime. Great game , thanks Nick . it may take a while for me to paint my Brits , they’re in the long term project pile .